The disappointment of England’s supposed ‘Golden Generation’ of the 21st Century, particularly at tournaments between 2002 and 2006 may be the freshest in our minds, but the failure’s of Becks & co in Japan and Germany will never come close to the desperate collapse by England’s Golden Generation half a century earlier at the 1950 World Cup in Brazil. The Three Lions first World Cup was a much-anticipated event, although far more-so by the rest of the world than the English themselves. Hailed as the ‘King’s of Football’ by the Brazilian press upon their arrival, the spotlight would be firmly focussed upon England in South America. In an England squad blessed with talent, arguably the countries finest ever assembled and spearheaded by the great Stanley Matthews, anything short of the trophy would constitute failure. Even the briefest of glimpses at England’s squad at the tournament reveals a star-studded squad. At the age of 35 Stanley Matthews was arguably still the standout player. His Blackpool teammate Stan Mortensen was at the peak of his powers though, aged 29, and would lead England’s line as one of the most prolific strikers in the country at that time. Other forwards included two of the finest players in the North East; Jackie Milburn and Wilf Mannion, and of course Tom Finney, who like Mortensen, was probably at the high point of his career when the tournament came about. Midfielders included Portsmouth legend Jimmy Dickinson and Manchester United’s Henry Cockburn, whilst the defence would be anchored by the likes of Billy Wright and Alf Ramsey. How is it then that such a gifted group of players, a number of whom are considered among the game’s all time greats, could crash out so spectacularly and with such ignominy, suffering defeat at the hands of rank amateurs. Is it just another case of the English overrating their own talent pool, were we a victim of over-confidence or was there a little more to it than that. Sixty-six years on, the wounds of humiliation in Brazil have healed, but that does not mean an inquest is not called for. There were a myriad of problems that the England team faced following touchdown in Rio, however, the warning signs began weeks before that. 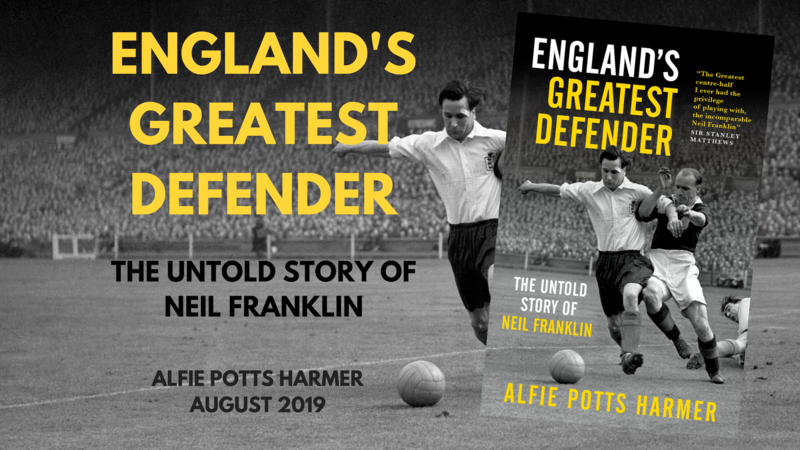 England’s finest defender throughout the late 1940’s and one of the most accomplished players in the country, Neil Franklin, would have been one of the first names on the team sheet in Brazil. Franklin declined a place at the World Cup with his wife due to give birth that summer, and was then ruled out of contention by the FA anyway, as Franklin moved to Colombia, joining Independiente Santa Fe to avoid the domestic wage cap imposed by the FA. The first true ball-playing defender, Franklin was pivotal to that England team. Billy Wright said of his absence, “We had lost our linchpin with the World Cup just weeks away. I was fond of Neil and understood his motives, but I could have kicked him for his timing,” whilst goalkeeper Bert Williams even went as far as to suggest England would have won the World Cup with Franklin in the side. As important a player as Franklin was, and he certainly was just that, his absence alone cannot be used to justify England’s complete collapse. The England team had not been fully prepared for life in Brazil, and were not helped by those who organised the trip. The journey to Rio was a gruelling 31-hour trip including stops at Paris, Lisbon, Dakar and Recife. When the team finally reached touchdown in the then-Brazilian capital, men with gas masks boarded the plane and sprayed all the passengers down with pesticides, reportedly leaving them coughing and spluttering. Hardly the warmest of welcomes. Whilst the England team hotel, ‘The Luxor’, still sits proudly on Copacabana beach, the area was a little less luxurious when Walter Winterbottom’s men checked in over half a century ago. Brazil was a major culture shock for the entire England team, most of whom had never ventured outside of Europe. The food provided at the hotel was not suitable for elite sportsmen during a World Cup. Wolves shot stopper and England goalkeeper Bert Williams described one of the meals as “a bowl of olive oil with a piece of bacon floating around in it.” This lack of decent nutrition in conditions no England player would have any familiarity with playing in could certainly be considered a major factor. The food wasn’t the only thing that shocked the England team. Their first game was hosted at Brazil’s Maracana, one of the world’s great footballing arenas. However, not from where the England players were sitting. The stadium was dilapidated and in need of immediate repair work. Building was still ongoing at the Maracana, leaving it mostly empty with an attendance of only 29,703 for England’s game against Chile, compared to the officially 173,830 (widely believed to be more than 200,000) that crammed into the venue for the World Cup final less than a month later. Rats infested the cold, damp and dirty changing rooms. But England were resolute, if not spectacular, and rose to see off Chile in a 2-0 win with goals from Mortensen and Mannion in either half. England’s next game, 4 days later, took place over 250 miles away in Belo Horizonte, and probably still goes down as the most humiliating and shocking defeat in the countries history. The story goes that a bunch of ragtag, part-time, amateur players were hastily assembled for the World Cup and shocked the world by beating the founders and supposed “King’s” of the game in England. Unlike most fairytale stories of this ilk, the story is incredibly close to the truth. The US team really were made up of rank amateurs. Their goalkeeper was a baseball player turned ‘soccer’ player who never kicked the ball, with the US defenders having to take his goal kicks. The US goal scorer, Joe Gaetjens was Haitian born forward who worked as a dishwasher in a New York restaurant. A few days later, back at the Maracana, England faced Spain. With Spain having won both their ties against the US and Chile, England would need to win by a two goal margin to progress. They did not. In fact, they lost again. A goal early in the second half by Telmo Zarra booking Spain’s place in the next round and leaving England tied with both Chile and the US with one win and two defeats to their name. The humiliation passed with little recognition at the time. The US’ shock result in particular was news virtually everywhere except England, where the West Indies first victory at Lords dominated the back pages. England wouldn’t make amends until 16 years later, when one of the men who had been part of England’s disastrous tournament in Brazil, Alf Ramsey, guided them to the trophy on home soil in 1966. England did have the strongest squad at the 1950 World Cup. It was a team of immense talent, which had only lost one official international to non-British opposition in the last 11 years, a period which included an 8-2 win over the Netherlands, a 10-0 win against Portugal and a 4-0 win over Italy. The absence of Franklin (and to a certain extent Matthews), the culture shock, the lack of decent nutrition and having a sole team selector with zero football management experience all contributed to what ought to be considered the greatest failure and missed opportunity by an English ‘Golden Generation’ in history.